Unlike the Big Twins, there have been a lot of versions of Sportster and Buell heads offered over the years. This article is provided to shed some light on the differences between them. This design provided a squish band over the stock flat top piston, the only year that an Evolution 883 had a squish band. 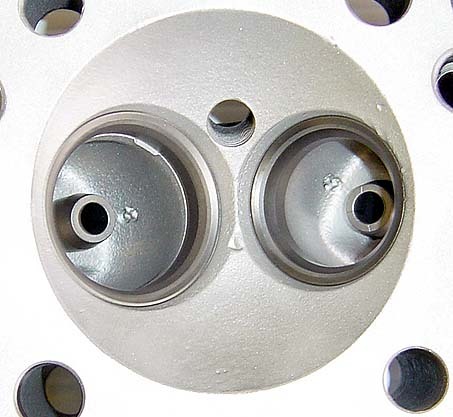 As a result the valves start out closer to the pistons and closer to each other. This makes 883 heads poor candidates for very large valves or high overlap cams that have high TDC lift figures. The 883 head has a small chamber to match the 3" bore of the XL883. For 1986, this chamber was a bathtub shape, providing squish bands on both sides. The 883 chamber is also shallower than the 1100/1200 chamber and the valves are longer to match. Because of this, when using any 883 head you must keep in mind that the valves are starting out closer to the piston and closer to each other. 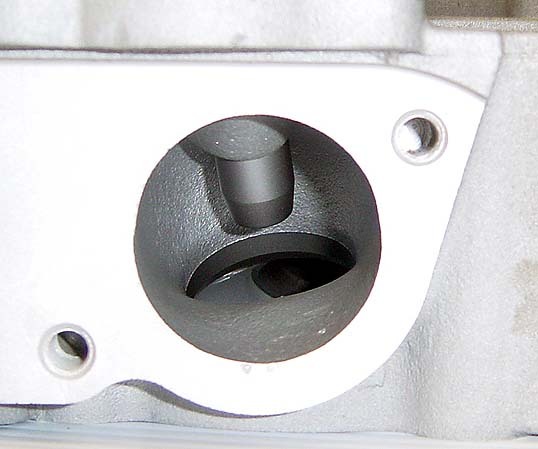 Cams with high "TDC lift" figures may cause valve-to-piston or valve-to-valve contact issues. Always check to be sure. roof through the bowl that necks down to a tiny valve. 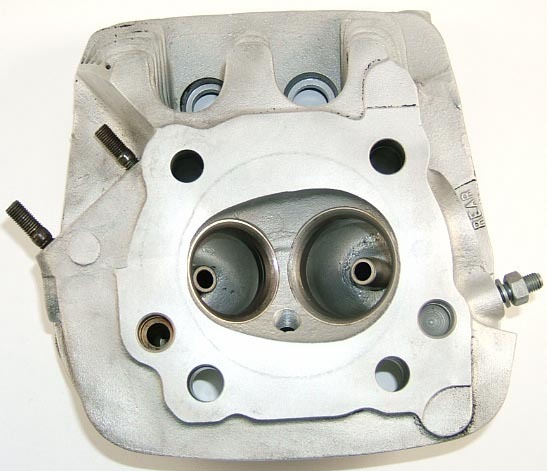 883 heads have the same size ports as the 1100/1200 heads until it enters the bowl area, at which time it necks down to the small valve seats. The seats in an 883 head are notorious for being poorly blended into the bowl. A good competition valve job that opens up the seat i.d. and blends it into the bowl does wonders for an 883 head. The seats in any of the 883 heads are the same o.d. as the seats in the 87-03 1100/1200 heads. As such, they can be opened up to accommodate the larger 1.715"/1.480" valve sizes. Standard 1100/1200 valves are too short for the shallow 883 chambers, however, "conversion" valves are readily available that have the larger diameter heads and the longer 883 lengths. One of the big advantages to using 883 heads on a 1200 or 1250 conversion, as opposed to the 88-03 1200 heads, is that when you put the 883 chamber over a 3.498" diameter bore, you gain a 1/4" squish band around the perimeter of the chamber. The squish band increases chamber turbulence which helps fight detonation and makes the motor more efficient. However, if you put these heads over a 1200cc conversion and use flat top pistons, your compression ratio will be about 11.5:1, which is really pushing it for pump gas. For this reason, 883 to 1200/1250 conversions usually use a dished "conversion" piston to get a streetable compression ratio. Hammer Performance offers some of the best conversion pistons on the market. The chamber volume and valve sizes remained the same as the 1986 model. For 1987, the big change in the 883 head was the chamber shape. It became the 3" round, hemispherical shape that continues to this day. These heads, and the 5-speed versions, are very common and easy to come by, as many were taken off and replaced with 1200 heads when converting to a 1200. However, as noted above these heads make for a better conversion than the common 88-03 XL1200 head in a couple of ways. Most of these heads are silver, although some late model versions were made in black for specific models such as the XL883R. Like the 883 heads of the same year, this design provided a squish band over the stock flat top piston. These are ultra-rare Sportster heads and they were the best factory head ever made for a Sportster until the Thunderstorm head came out in 1998. They have very large valves and a pear-shaped chamber with flat squish bands on each side. The ports are not particularly good, though, with a lot of rough, uneven surfaces. The floor is reasonably tall but shaped poorly. The seats are factory blended into the bowl unlike other XL heads, but the blending leaves a very sharp edge on the short side. A good porting job makes these into a very fine performance head. For 1987 the 1100 heads were given smaller valves. The chamber remained largely the same however. These heads are better than the 88-03 1200 heads just due to the better chamber. With the new larger 1200cc displacement for 1988, the chamber was enlarged and the squish bands eliminated to match the new 3.498" bore size and keep the compression ratio down. This results in an open, hemispherical chamber, with poor chamber turbulence (turbulence in the ports is bad, turbulence in the chamber is good). See below for pictures of the 91-03 version of this head which is almost the same thing. If you're going to take advantage of the 5-speed crankcase breathing, your 4-speed lower and middle rocker boxes will need to be swapped to 5-speed versions. Likewise if you're putting 4-speed heads onto a 5-speed, you'll need to modify your heads to allow breathing out the carb bolt holes (Hammer Performance can provide this service) or alternatively, use XB style rocker boxes. 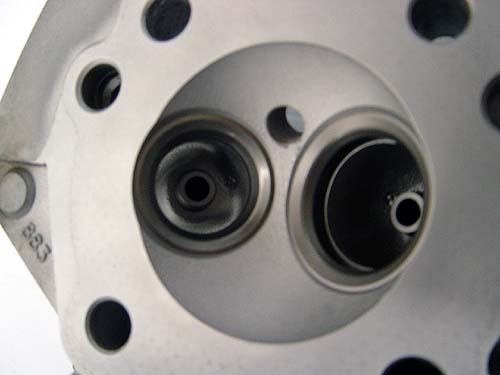 There are no significant differences between an 87-90 and a 91-03 883 head other than the pushrod hole locations and the crankcase breather provisions as described above. 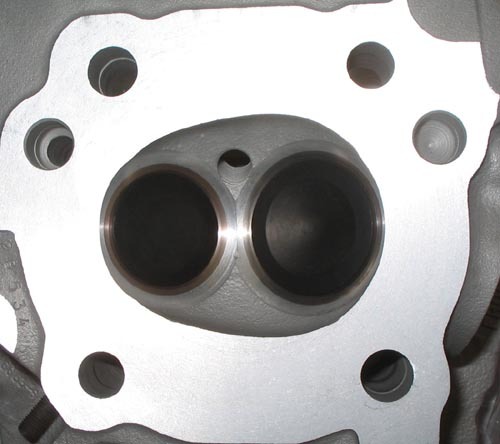 There are no significant differences between an 88-90 and a 91-03 1200 head other than the pushrod hole locations and the crankcase breather provisions as described above. This is one of the most common Sportster heads you'll come across, as it came on every 1200 Sportster from 1991 through 2003, except the 98-03 XL1200S model. Unfortunately, for performance applications it's not a particularly good head, as the ports are turbulent and the chamber is not, which is just exactly the opposite of what you want. See the pictures below for more information. rather than convert to this vintage of 1200 heads. This picture also shows the very squared off roof area through the bowl in both ports. Notice the sharp angle near the stamped numbers. a very good port due to the low floor and squared off roof through the bowl. These heads were identical to the 91-03 XL1200 heads described above except that the spark plug side front motor mount bolt hole was 7/16-14 instead of 3/8-16. So be aware that not all Buell heads are higher performance than all Sportster heads. In 1996 a new cylinder head was introduced on Buell S1 Lightning models. They were standard equipment on 1996-1998 S1 models (not S1W), 1997 S3 models, 1997-1998 M2 models, and 1998-2003 1200S Sportster Sport models. The Buell Blast uses a version of this head too. They were also available in the Screamin Eagle catalog, initially with a "Lightning" script in the fin area just below the rocker box, and later with a "Screamin Eagle" script. Versions were offered in silver as well as black with polished fins. Many of the black with polished fins versions (including those on the 1200S) had dual spark plugs as well. Buell versions of these heads use 7/16-14 bolt holes for the front mounting bracket while Sportster versions used 3/8-16. The Lightning head has the same ports and valve sizes as the XL1200 heads of the same vintage and as such they flow exactly the same. The Screamin Eagle catalog at one time claimed 8% more flow but I've flow tested lots of them and the range of results I get is the same as the standard 88-03 XL1200 heads. The one big difference in a Lightning head is that extra material was added to the chamber to reduce the size and raise the compression. Over a 1200cc flat top piston these heads give about 10:1 compression. 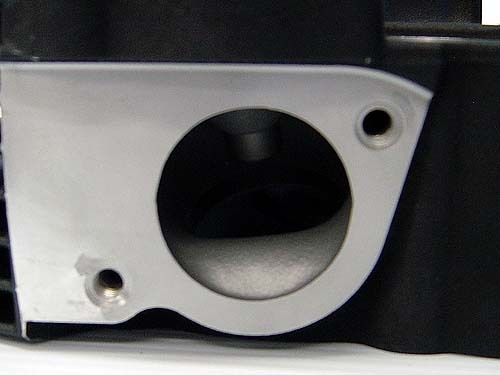 The chamber material is cast into a 10 degree squish band, however, all of the bikes that had these heads from the factory used flat top pistons, so the squish band was ineffective. Hammer Performance offers an angled dome piston to match these heads and can even machine the squish band into a nice, even shape for maximum effectiveness - as cast, it's very rough and uneven. The big down side to a Lightning head is that the extra material used to make the chamber smaller also ends up shrouding the valves badly. This hurts low-lift flow, and is especially bad when used with larger valves. When we do a SMASH or SLEDGE porting service to a Lightning head, we always unshroud the valves heavily to cure this problem. In 1998 a new cylinder head was introduced on Buell S1W and S3 models. In 1999 these heads were made standard equipment on all Buell models and they remained that way through the 2002 model year. The Thunderstorm head has multiple improvements over the Lightning head. Not only are the valves significantly bigger, but the ports were improved as well, with a higher floor and a more gently radiused roof through the bowl area. The chamber was enlarged back to 67cc to unshroud the larger valves, and the squish band angle was changed to 15 degrees. These were paired with a factory piston to match and utilize the squish band, which HD had never done on Lightning heads. A stock Thunderstorm chamber improves on the Lightning chamber by unshrouding the much larger valves. around the perimeter, making it difficult to achieve a good squish clearance. 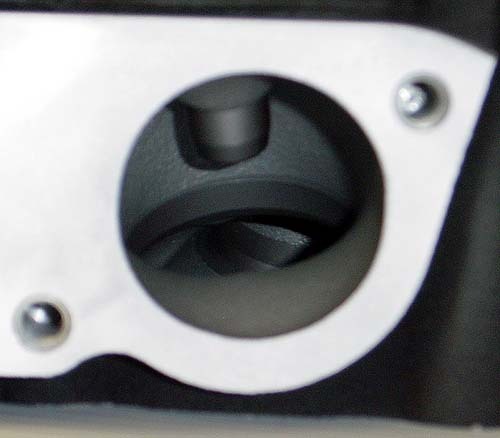 The unshrouding resulted in a 67cc volume and requires a matching domed piston to get 10:1.
as compared to the picture of the XL1200 chamber above. Look near the stamped numbers and compare. through roof area in the bowl. Valve sizes were increased as well. These are very popular heads to retrofit to Sportster models. They're almost a bolt-on; the only issue you have to deal with is that the front motor mount bolt holes are 7/16-14 instead of the Sportster's 3/8-16. It's generally fairly simple to drill out your factory motor mount however. Contrary to what you might hear, the springs, retainers, locks, guides, locaters, and valve stem seals are all standard HD pieces in a Thunderstorm head, the exact same part number pieces that you'll find on every other Evolution Sportster and Big Twin head of that era. The Thunderstorm heads do not have any special hardware other than the larger diameter valves. Thunderstorm Heads are available direct from Hammer Performance. For 2004, the Sportster got a new rubber mounted motor. Along with that change, the factory adopted a black with highlighted fins version of the Buell XB heads (introduced on 2003 Buell XB models) onto all 1200 Sportsters. In later years an all-black version was also offered. All of the heads also got new 7mm valve stems and a beehive spring pack just like the XB heads. The new seal assembly affords more retainer to guide seal clearance and can safely accommodate up to .550 lift cams, as compared to .500 in the earlier heads. The fins on rubber mount heads are a little larger than the fins on the earlier heads, so they won't match up to your cylinders quite as well. It's most noticeable on the left (spark plug side) but most people don't think it looks bad at all. 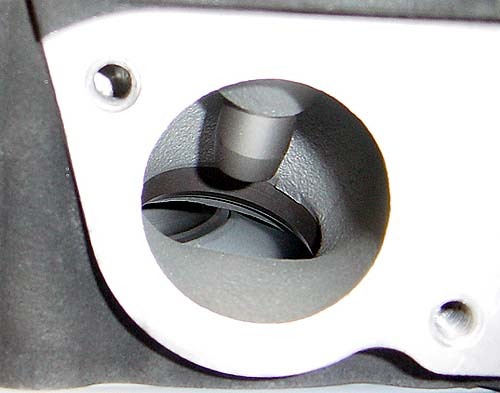 The front motor mount bolt holes are 7/16-14 (like the Buell heads described above), but also the right front bolt hole (pushrod side) has been moved inboard 1/4". A special bracket is readily available from HAMMER PERFORMANCE to take care of this and allow you to bolt the heads right on to your 03 or older Sportster. As delivered from the factory, these heads are .020" shorter than the previous generation heads, at 3.670" instead of 3.690". Normally this is not enough to worry about with respect to pushrod length and manifold fit. However if you're shortening the motor further via thin gaskets or further decking, it's something to be aware of. Once you've shortened the stack by .045 to .050" overall you need to be thinking about these things. None of these late model heads are available from the factory in an assembled form. You have to buy the heads bare and then buy the valves, springs, retainers, locks, and guide seal/locaters separately and do the assembly yourself. However, HAMMER PERFORMANCE sells these heads fully assembled and ready to bolt-on for the same price that the heads and hardware will cost you at your dealer. We'll also include our special High-Flow Swirl Polished Stainless Steel valves instead of the cheap factory valves, again at no extra cost! There are no significant differences between a 91-03 and an 04-up 883 head other than the changes mentioned above. These heads came in either straight black or silver, no highlighted fins have been offered on 883 heads. One thing to be aware of: in 2007, HD changed the bolt hole spacing for the intake manifold flanges. If you're using 2007 or later heads on a 2006 or earlier motor, you'll need new intake manifold flanges to match. These are readily available from HAMMER PERFORMANCE. These, and the 04-up XL1200 heads, are the best performance heads for Sportsters and Buells ever offered by Harley Davidson. They retain the same valve diameters as the Thunderstorm heads (previously the best heads), but the ports have been improved significantly with a floor that's been raised even higher and an even more gradual radius through the bowl. These two changes work together to greatly reduce port turbulence, because they reduce the difference in the length of the floor and the roof, thus reducing the difference in velocity. On the flow bench, these heads flow about the same as a Thunderstorm head, but the improved velocity and reduced turbulence often add up to a 4-5 horsepower advantage over the Thunderstorms when comparing a stock head to a stock head. for cutting 15 or 30 degree angles to match angled dome pistons. Despite the compactness of the chamber and the large valves, the valves are not shrouded. as compared to the XL1200 and Thunderstorm heads pictured above. however stem sizes were reduced to 7mm. The chamber on these heads is also improved and harkens back to the 1986 1100 head, with a compact, pear shaped chamber. This arrangement results in minimal valve shrouding and a lot of squish band surface area. These heads are also a great candidate for angled squish bands because the give a lot of material to work with. Angling the squish bands directs the fuel being squeezed out more directly at the flame front, and also reduces the shelf that the air must go around to get in or out of the chamber. HAMMER PERFORMANCE can modify your heads for angled squish bands and provide the matching pistons. Buell XB heads are available in black or silver. 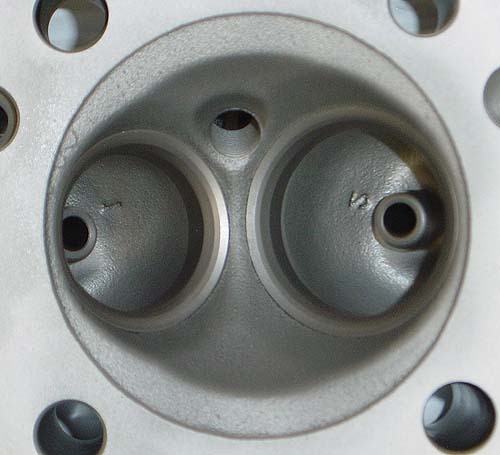 When putting XB heads onto a Sportster, you'll quickly discover that XB heads do not have the carb mount holes machined or tapped. This is because Buell XB's use a downdraft fuel injection system and breathe their crankcases out through the rocker box tops. However, the boss is in place, and HAMMER PERFORMANCE can machine, drill, and tap the bolt holes. XB Heads are available direct from Hammer Performance. The carb mount/breather bolt holes are already drilled and tapped, no need to do it yourself or have it done. These heads are black with highlighted fins. They are not available in straight black or silver, use the XB heads if you need silver. These heads do not have a provision for a head temp sensor. Buell XB heads and the 2007-later XL1200 heads are equipped for a temp sensor on the rear head. A Screamin Eagle head is available that is based on this head. The SE version uses the same casting, and the ports and valve sizes remain the same and as such they flow the same. The SE version has been decked an additional .050", making it a full .070" shorter than an 03 or older head. This is excessive in our book; it puts it at the absolute limit as the valve seats are right at the edge of the chamber. Be SURE to use shorter pushrods with SE heads and also check valve to piston clearance carefully as well as your intake and exhaust fit. A stronger spring pack is included on these heads, but unfortunately, the spring pack they chose forced them to sink the spring pockets by .120". This makes the roof of the ports thinner and limits what a head porter can do with it. Due to these differences, the stock head is a better candidate for modification than the SE head. 04-06 XL1200 Heads are available direct from Hammer Performance. HD made a small change to the floor of the intake port. The change actually makes the flow through this port slightly less laminar than the 2004-2006 head. It's not an enormous difference, but in stock form this head is capable of supporting a few horsepower less. These heads are available in straight black as well as black with highlighted fins. They are not available in silver, use the XB heads if you need silver. HD made a couple changes to the surface where the manifold attaches, to accommodate the EFI throttle body. This area is now machined down 1/16 of an inch (.0625") as compared to all previous carb type heads and XB heads. If you're using 2007 or later heads with a carburetor, you'll want a wider manifold, which HAMMER PERFORMANCE offers here. Some people have made it work with a regular carb type manifold with careful centering, but more often than not, it causes issues with the engine sucking the seals in. The other big change to the manifold area that HD made was to widen the bolt pattern. This is really nice as it makes the access to the bolts much easier, allowing the use of standard hex head bolts. But it means you'll need the new flanges to match. HAMMER PERFORMANCE offers these new flanges here, and they are not expensive. A version of the Screamin Eagle head is available that's based on this head as well. It has all the downsides of the 2004-2006 version. and therefore we do not recommend it. 07-Present XL1200 Heads are available direct from Hammer Performance. 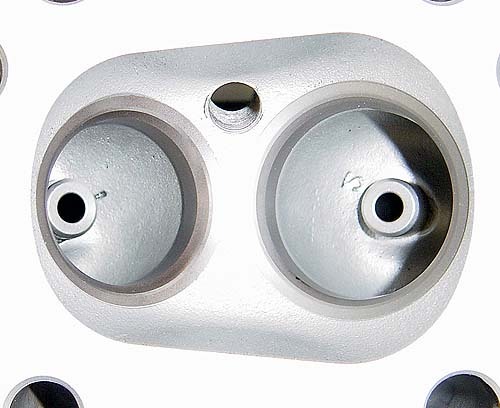 The 2007-Present (EFI) 883 heads received the same intake manifold area changes described above for the XL1200 heads. Other than that, there are no significant changes from the 2004-2006 version.